Amazon maintains galleries of multiple versions and sizes of buttons that are available for your use. Button sizes depend on the category of button that you choose for your application. For Login with Amazon buttons, see the Login with Amazon Button Guidelines, and for Amazon Pay buttons, see the Merchant Tools page on the Amazon Pay website. The following chart explains more about each button widget option. Note that while the button text is not technically tied to the functionality that you assign to it, you should use the button labels according to the use cases below to avoid customer confusion. Use this button to let a buyer sign in to your site using their Amazon account information. Buyers can sign in before or during the checkout process. Access buyer profile information — Depending on how you set the scope parameter in the button widget, you can access information from the buyer’s Amazon profile, including their name, email address, and a unique userID. You can use the profile information to customize the customer’s shopping experience and track their browsing history. The userID can be used to identify returning buyers. Create a local account for your buyers — With the information obtained from the Amazon user profile, you create a local account in your shop. This account is equal to your normal shop accounts and offers the same benefits to you and to the customer. The only difference is that the accounts created with the Amazon Login don't have a password created by the customer. Use this button to let a buyer initiate an order transaction from your cart page or any product detail page and access their shipping and payment information using their Amazon account. When a buyer clicks the Amazon Pay button, they sign in using their Amazon user name and password before accessing their shipping and payment information. Checkout with Login — As with the Login with Amazon button, you can request that the buyer share their profile information with you when they first sign in to your site. Guest checkout — The Amazon Pay button can be used to let a buyer complete a purchase without sharing any personally identifiable information with you before completing a transaction. When a buyer signs in to access their shipping and payment information, you receive only the buyer's city, country, and postal code for calculating tax and shipping. The buyer doesn't see a consent screen when they sign in using Amazon Pay as a guest. After the buyer completes the checkout process, you receive only their name, email address, and shipping address. Replace YOUR_MERCHANT_ID with your own Merchant ID, which you received during registration. If you aren't sure what your Merchant ID is, check your Merchant ID by signing in to Seller Central and going to Integration > MWS Access Key. The type parameter is an optional parameter for indicating the type of button image that you want to choose for your webpage. Note that if you decide not to specify a value for type, the LwA (Login with Amazon) button is set as the default value. The size parameter is an optional parameter for choosing a button size. For more information about button size options, see the Button guidelines. The language parameter is an optional parameter for associating a language with a Login with Amazon or an Amazon Pay button. This is useful for offering multi-language support for an Amazon Pay and Login with Amazon experience for buyers on your website. For example, a French-speaking buyer wants to make a purchase from a German website. The buyer, either by changing the language preference settings in their browser or by making a selection from a language switcher on your website, can view Amazon Pay components in French. If you pass a language other than those listed above, the language defaults to the buyer's browser language. If the buyer's browser language preference setting isn't one of the languages listed above, the language defaults to English. For more information, see Amazon Pay and multi-language integration. Gives access only to the user-id from the user profile after login. The payments:shipping_address provides access to the buyer's shipping address. To retrieve the full shipping address, you need to call the getOrderReferenceDetails API. For more information, see "Getting the Shipping Address from Amazon" in Step 4: Add the AddressBook and Wallet Widgets, or GetOrderReferenceDetails in the Amazon Pay API reference guide. The popup parameter determines whether the buyer is presented with a pop-up window to authenticate or if the buyer is instead redirected to an Amazon Pay page to authenticate. If you're hosting the button widget on a non-secure page or for a smartphone-optimized experience, we recommend using the redirect experience. true — Presents an Amazon Pay authentication screen in a pop-up dialog. Recommended for desktops where the button widget is presented on a secure page. Be aware that this option requires the button to reside on an https page with a valid SSL certificate. false — Redirects the buyer to an Amazon Pay page within the same browser window. Recommended for mobile devices or if you're rendering the button widget on a non-secure page. Be aware that the redirect URL must use the https protocol and have a valid SSL certificate. 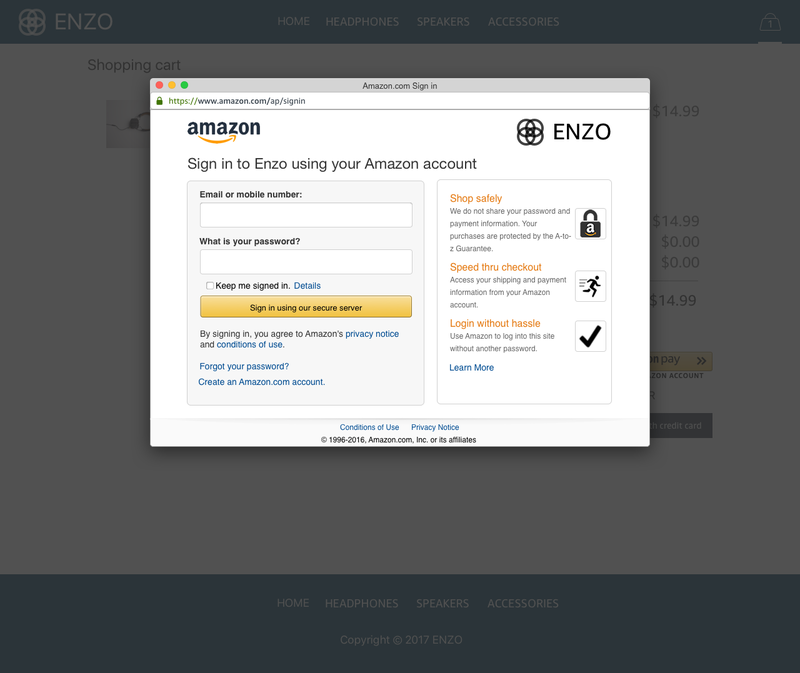 When the buyer clicks the Amazon Pay and/or Login with Amazon button, the Amazon Pay authentication window launches, and the buyer is asked for their Amazon account email address and password. When the pop-up parameter is set to false (popup: false), clicking the button redirects the buyer to the Amazon Pay authentication page within the same browser window. The redirect URL is a parameter that determines which page the buyer is redirected to after successfully authenticating. For example, after a successful authentication, you might want to take the buyer to the next page in your checkout pipeline to collect their shipping address and/or payment method details. Be aware that if you use popup:false in your button code, which means that you use the redirect login experience, you have to whitelist all the redirect URLs in Seller Central in the Login with Amazon settings for your application. We also recommend that you implement an onError handler in your code. The onError code is optional, but it can save you considerable effort with troubleshooting integration issues. For more information, see Testing your integration in the Sandbox environment. For users who have signed in, you must offer a logout option (often a hyperlink) on your website. The logout option should delete any cached tokens and remove the user's profile information (like their name) from your website. Then your website can present the login button again. Subsequent calls to amazon.Login.authorize present the login screen by default.